The Clemson Tigers Football are another fantastic team in the ACC and represent one major part of the Clemson Sports program at Clemson University. They are a member of the NCAA's Division I, or better: the Atlantic Division of the Atlantic Coast Conference and play according to this Clemson Football Schedule. Way back in 1896, Walter Riggs came to Clemson. He had always admired the Princeton Tigers, and hence gave Clemson the Tiger mascot. Across all college football conferences the Tigers have plenty of rivals, but the 'in-state' one are the South Carolina Gamecocks. The two institutions compete against each other in many sports, but the annual football game receives the most attention. Clemson is also currently the leader among ACC schools for conference championships at 13, having last won a title in 1991. Clemson also won two Southern Conference titles before joining the ACC. The program has participated in 30 bowl games over the years, winning 15. The 1981 squad, led by Head Coach Danny Ford, became the first athletic team in school history to win a national championship. Clemson defeated Nebraska 22–15 in the Orange Bowl in Miami, Florida to win the 1981 NCAA Football National Championship. Some of the most notable coaching names in Clemson football history are John Heisman (also coached at Akron, Auburn, Georgia Tech, Penn, Washington & Jefferson, and Rice; the Heisman Trophy is named after him), Jess Neely, Frank Howard (whom the playing field at Death Valley is named after), and Danny Ford. Dabo Swinney, the current coach, was named head coach of the Clemson Tigers football team in late 2008. Before each home game, the team ends pre-game warm ups and proceeds to the locker room. With just five minutes to go before game time, two buses leave the street behind the West Endzone both full of Clemson football players. The buses pull to a stop at the gate in front of The Hill, and the Tigers gather at the top, where each player proceeds to rub "Howard's Rock" (which is an imported rock from Death Valley, California that was presented to Frank Howard in 1967). While Tiger Rag is played and a cannon sounds, the Tigers run down the hill onto the field in front of over 81,000 screaming fans. The last College Football Bowl Game victory for the Tigers was in 2009, when they won the Music City Bowl. 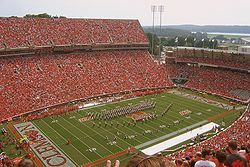 The Clemson Tigers home games are played at Clemson Tigers Memorial Stadium. Come, get your Clemson Football Tickets, put on your Clemson Apparel and join all the other fans in this great stadium. Motorola RAZR V3m Snap On Case - NCAA Clemson Tigers Brand new officially licensed NCAA cellphone accessories. Durable hard plastic material. Custom made to fit your phone perfectly. Easy access to all buttons and features. Easy installation just snap on your phone without any tools. Plug your charger cable or headset without removing the case. Prevents damage to your phone from objects in your pockets or purse. Phone not included. sku:motlea175 It does not fit V3i V3t V3e & V3r.